Staying organized has never been one of my strengths. I try and try again. I love organizational tools, like containers and planners, but when it comes down to it, I still end up with a messy desk, sticky notes all over, pieces of paper with ideas written down all over the place, including my car, which is where most of my ideas come from! Being a business owner, I wear many hats. I actually wear ALL the hats related to my company. Pet trainer, author, blogger, public speaker, entertainer, social media expert, videographer, producer, advertiser, graphic designer and of, course, a Dog Mom, Cat Mom and Daughter. I have a lot of ideas and to-do lists floating around in my head, on my desk, in my car…. My first stop was my local office supply store to pick up a ton of spiral notebooks. OK, not a ton, about 20. I labeled each notebook with my main topics that I have ideas. Blog posts, social media ideas, video ideas, advertising, you get the idea. I made these notebooks about 2 weeks ago, and they are quite helpful when I know I want to work on a project, I just grab my notebook for those ideas and lists. Now, the actual lists and jotting notes is what ties me up a bit. I keep extra note pads in prime locations, with at least three pens next to them. When I have an idea, I can quickly jot it down. That part is easy. 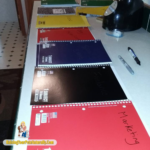 The part I slip up on is staying organized by then taking those notes and either taping or entering them in the proper notebook. This is a step I have to really stay on top of. This is one of my “keep trying” things. My next organizational tool is to try to keep me on a daily track. Meaning, when I sit at the computer to do work, I tend to go from one idea to the next. By doing this, I feel that I am not accomplishing my tasks. Granted, I’m still doing work and something is getting done, but it may not be what I had planned for the day or week. This can be a bit challenging to schedule ahead because of the other part of my business, actual dog and cat behavioral training, returning client inquiries etc. So, my goal is just to have a topic for the day to work on in between seeing and talking with clients. So, today I made a new tool, my magnetic dry erase board. I started with a large, magnetic dry erase board. 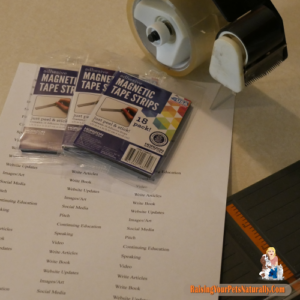 I purchased magnetic tape strips (1/2″) and made labels for 24 tasks that I wanted to accomplish in a month (blog writing, social media, video etc. ), and attached them to the magnet strips. Now, I have 24 magnetic topics for the month! I placed one on each day, leaving Saturdays open for free or make-up days. Since they’re magnetic, I can change them around as I need, which is easier than writing, erasing, and re-writing. Now, when I sit down to work at my desk, I will have my task for the day to work on. If I never get to sit down to work, which does happen, then I will just skip it. I’m hoping that helps get my to-do list accomplished better. The other organizing tool I’m trying out is Google’s Keep app for checklists and notes, which synchs between the computer and smart phone. Right now, I’m working on getting my article ideas organized, so when it’s time to write a blog post, I can open it up, pick a topic and go. I’m hoping this will also help me get more words down, whether on paper or computer. Finally, the last step is a timer. It’s so important to take breaks, stretch and unwind. I can get so focused on what I’m doing that the time flies by. My plan is to set the timer for 60 minutes, then do a little something with Dexter. Maybe a potty break, a little play, or just a belly rub. Then, back to work. All I can do is to keep trying to stay on track and keep trying to stay organized. We all have our weaknesses, and this is certainly one of mine. I’m an organizing freak waiting to make an appearance. What are your must-haves for staying organized? Oh my, I need to implement some of these tips. I’ve got too many projects and the juggling is getting a bit overwhelming! Thanks, Amy. I know exactly what you mean. Please let me know if you try any and how it works for you. I’ve always said, organization is key to success and happiness! Ah the bane of paperwork and scheduling tasks! Some fantastic tips here. Good luck with your “juggling” and have a great rest of your day. Can I hire you to organize my office?! I have been procrastinating on my filing and organization of my office and it just makes me frustrated . Back to school items are back on sale and I made a trip to do a shop for binders and files to start my office organization. Being organized makes for a clearer mind and makes me work better. Ah, organization! I don’t know what the heck I would do without the Notes app on my phone. I keep ALL of my ideas there, draft blog posts while on the Subway, and have my to-do lists ready at all times. It’s saved me so many times! wow … some good ideas! 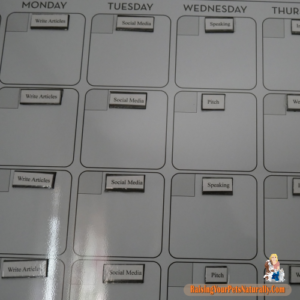 I like the magnet board … I could use that not just at home but at my day job too…. maybe colour code for each employee as well….oooooh you may have created a monster! I am in a constant state of trying to become organized. Thank you for sharing these ideas! Maybe it will help me finally complete the process and eliminate my disorganized tendencies! I love that you’re using notebooks and a dry erase board, making physical notes instead of jotting them into your phone or computer really seems to work well. I’m the most disorganized person ever, but seeing your dry erase board makes me really want one again. Go for it! I’m loving it. The personalized magnetic tasks are my favorite. The desk here is also a mess! Renovating the office is on my list of things to try to do this year. I used to be very organized when I was a teacher/professor. Slowly getting back to organization with the blogging. I teach dog training classes, and that’s always organized. Hmmm, I might need to think of all my projects in that way. I used to have a great memory, but somewhere along the way, that changed. I’m still trying to find the best system to keep me organized. I do think that a slightly messy desk can help nurture creativity. I’m not sure if it is the desk itself or giving yourself the freedom to think about other things than the mess. 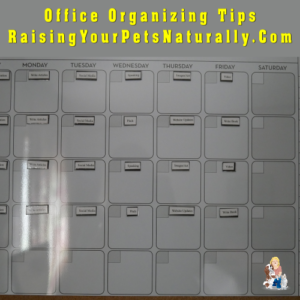 Great info/ one can never be too organized! Thanks for the tip. I’ll have to check out Ever Notes. This is such a timely post for me! We just moved to another state and I’m in the process of (trying to) set up my office/photo studio. 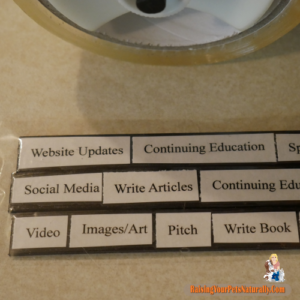 I love your magnetic tabs idea, that would save me some time. My biggest go to item is a dry erase board. Sadly, my current board is tiny & becoming cumbersome. My new office will have a large white dry erase board. I wonder if I can find a combination dry erase/magnetic board, that would be so great. Thanks for this article! I wish you best of luck on getting organized in your new place. Congratulations. I love how organized you are!!! Now I want to go threw with my label maker and organize!! Such a great inspiration! You’re on the right track! Just keep plugging! I appreciate your note about the google app that I had not heard of. I look forward to putting that to use! Thanks, Bryn. A friend told me about it the other week and I’m digging it!